There is indeed no medal which possesses such wonderful power and none so highly esteemed by the holy Church as the Medal of St. Benedict. Whosoever wears this medal with devotion, trusting to the life-giving power of the holy Cross and the merits of the holy Father St. Benedict, may expect the powerful protection of this great Patriarch in his spiritual and temporal needs. St. Benedict (born at Nursia, Italy, in 480) had a profound veneration for the holy Cross and for our Saviour Crucified. In virtue of the Sign of the Cross, he wrought many miracles and exercised great power over the spirits of darkness. In consequence of the great veneration held for St. Benedict, a medal was struck which may date back to the time of St. Benedict himself. 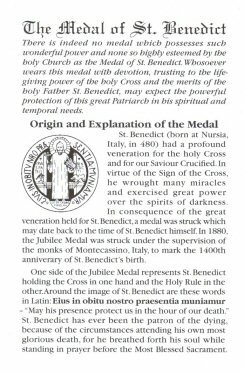 In 1880, the Jubilee Medal was struck under the supervision of the monks of Montecassino, Italy, to mark the 1400th anniverary of St. Benedict's birth. One side of the Jubilee Medal represents St. Benedict holding the Cross in one hand and the Holy Rule in the other. Around the image of St. Benedict are these words in Latin: Eius in obitu nostro praesentia muniamur – "May his presence protect us in the hour of our death." St. Benedict has ever been the patron of the dying, because of the circumstances attending his own most glorious death, for he breathed forth his soul while standing in prayer before the Most Blessed Sacrament. On a pedestal to the right of St. Benedict is the poisoned cup, shattered when he made the sign of the cross over it. On a pedestal to the left is a raven about to carry away a loaf of poisoned bread that a jealous enemy had sent to St. Benedict. Above the cup and the raven are the Latin words: Crux S-Patris Benedicti (initials on reverse side – see below). Below St. Benedict we read: Ex S M Cassino MDCCCLXXX – "From the Holy Mount of Cassino - 1880". The reverse side of the Medal shows the image of the Cross at the top of which will be the word PAX (peace) or the monogram I H S (Jesus). Around the margin beginning at the right hand on top, we have the following letters: V.R.S.N.S.M.V.--S.M.Q.L.I.V.B. which form verses supposed to have originated with the holy Father Benedict himself: Vade Retro, Satana! Nunquam Suade Mihi Vana Sunt Mala Quae Libas Ipse Venena Bibas: "Begone, Satan! Suggest not vain things to me. Evil is the cup thou offerest; Drink thou thine own poison." In the angles of the cross are found these four letters: C.S.P.B. : Crux Sancti Patris Benedicti – "The Cross of the Holy Father Benedict." On the vertical bar of the cross itself are found the letters: C.S.S.M.L., and on the horizontal bar of the cross: N.D.S.M.D. They signify: Crux Sacra Sit Mihi Lux, Non Draco Sit Mihi Dux – "May the holy Cross be my light, Let not the dragon be my guide." The medal can be worn around the neck, attached to the Scapular or the Rosary, or otherwise carried about one’s person. The devout wearing of such an object, together with the Church's powerful blessing and intercessory power, make it into an unspoken prayer which has been shown to be of great help in maintaining holy purity, bringing about conversions, protecting against inclement weather and contagious disease. Often it is placed in fields, the foundations of houses and buildings, on the walls of barns and sheds or in one's home, car or place of business to call down God’s blessing and the protection of St. Benedict. The Medal of St. Benedict is one of the Sacramentals of the Church, and as such it must be used. The value and power of the Medal must be ascribed to the merits of Christ Crucified, to the efficacious prayers of St. Benedict, to the blessing of the Church, and especially to the faith and holy disposition of the person using the Medal. The following is a partial list of the many favors obtained through the devout use of the St. Benedict Medal. It obtains protection and aid for persons tormented by the evil spirit, and in temptations against holy purity. It procures assistance in the hour of death. It has often proved an efficacious remedy for bodily ills, a means of protection against contagious diseases and to destroy the effects of poison. The Medal is a powerful means to destroy witchcraft and all other diabolical influences. It secures for expectant mothers special assistance from heaven. Frequently this Medal has been found to be a marvelous protection against fire, tempests and storms on land and sea. Even domestic animals have been visibly aided by it when sick or injured. Graciously obtain for me from God those favors and graces of which I stand so much in need, in the trials, miseries and afflictions of life. Thy heart was always so full of love, compassion, and mercy towards those who were afflicted or troubled in any way. Thou didst never dismiss without consolation and assistance any one who had recourse to thee. I therefore invoke thy powerful intercession, in the confident hope that thou wilt hear my prayers and obtain for me the special grace and favor I so earnestly implore (mention it), if it be for the greater glory of God and the welfare of my soul.